Spirited driving and taking the family on the annual summer vacation are not something that usually go hand-in-hand. However, Mercedes-Benz has managed to create a vehicle that’s capable of fulfilling both of these desires at the same time. Mercedes-Benz announced it will produced the 2012 E63 AMG Wagon for the U.S. market, joining the E63 AMG Sedan which is already on sale. The E63 AMG wagon will be in direct competition with Cadillac CTS-V Wagon. 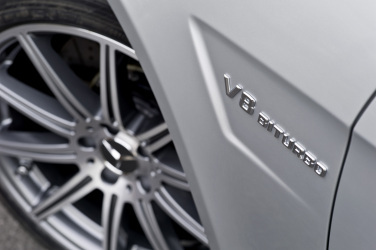 To counter the CTS-V Wagon, and its 6.2-liter supercharged V8 which produces 556 hp and 551 lb-ft, the 2012 E63 AMG Wagon will feature the same powertrain as the sedan variant. This means a 5.5-liter twin-turbo V8 engine, producing 518 hp and 516 lb-ft or 550 hp and 590 lb-ft with the optional AMG performance package. The 2012 E63 AMG Wagon also shares a number of other characteristics with the Sedan, including the AMG seven-speed MCT transmission, ECO stop/start technology and 19-inch AMG 10-spoke wheels. In addition to the above mention features the Wagon also gets a standard panorama sunroof. Pricing for the 2012 E63 AMG Wagon has not been released. However, judging by the 2011 sedan’s base MSRP of $87,600, you can expect the 2012 E63 AMG Wagon to have a slightly higher starting price when it goes on sale this October.